Open Fridays/Saturdays 11-5, call to make arrangement on other days. The idea of creating Page Wine Cellars happened in the summer of 1996.
throughout the Bordeaux region, falling in love with their incredible wines. After his culinary tour in Europe ended, he returned home to California. He simultaneously worked at several restaurants ‘saving every penny’, while apprenticing at a few Napa Valley wineries, with the goal and desire of making his own wines, under his own label. 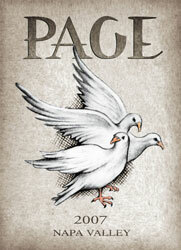 In 1997 Page Wine Cellars officially began. The first vintage of Proprietary Red produced only 36 cases. wines then the family name is labeled on the bottle. Page Wine Cellars is about hands on crafting our unique and remarkable wines. Bordeaux region that produce “Vins de Garage” or “garage wine”. In this tradition, we produce our wines in our warehouse, concentrating on the wine not the surroundings. For our wine this means an elegant mouth feel with edgy flavor profiles. This “elegance with an edge” style shines through with the cult following of our Revolver Cabernet Franc “The Fury” and our Revolver “The Stash”, a limited Cabernet Sauvignon. Dog friendly - It's ok to bring your dog! Our Tasting Room decor is as eclectic and unique as we are! Belly up to our handcrafted barrel stave bar and plant your booty on one of our rock 'n roll stools, or grab a chair at one of our tasting tables. Vintage winemaking equipment, a 22" disco ball, lava lamps, guitars, and our intimate family feel make Page Wine Cellars & Revolver Wine Co. a must stop...come check us out! Music in Tasting Room: Beatles, Led Zeppelin, Johnny Cash, Chili Peppers, Reggae, Disco, and just about whatever we feel...we love Pandora! Food Available: Chocolate Truffle & Wine Pairing, featuring selections of Michael Recchiuti's artisinal chocolates. To join the wine club, visit www.pagewinecellars.com or call 707-255-4665. Page Wine Cellars wine club members (our Groupies) have several options of membership. Our Bass (3 btls. ), 6-String (6 btls.) and 12-String (case) club members receive 3 shipments per year. The shipments are every season except summer. We also offer "Garage Band" memberships which allow for personalization of club shipments and allocations of limited production wines. All members receive complimentary tastings and discounts off of all wine purchased. The level of discount depends on which club you join. Please contact us at (707) 944-2339 for more detailed information. Thanks and we look forward to hearing from you!! !